OMG, spoken word is popping up everywhere! The Master Griot Project™ contends this is just the tip of the iceberg. ?Join in the manifestation of a new sphere for the spoken word industry. 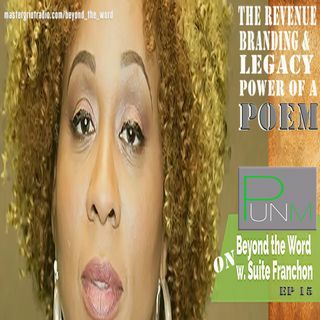 Move Beyond the Word with Suite Franchon to the limitless possibilities of the burgeoning spoken word industry. We have not yet seen all that the word can do. What do you envision for spoken word? Want to be a guest? Please, share what new things are you doing in or how you are expanding the linear views of spoken word. Follow up at mastergriotradio.com/beyond_the_word.